Templestowe, with the Yarra Valley to its north, extends westwards from Warrandyte to Templestowe Lower, 18 km north-east of central Melbourne. To the south is Doncaster. Ruffey Creek forms the boundary between Templestowe and Lower Templestowe, and Templestowe's south and east boundaries are King Street and Blackburn Road. The original Templestowe village (1852) was in the vicinity of the creek between Finns Reserve and the Templestowe Hotel, Templestowe Lower. Landholders included Edwin Unwin, proprietor of a Special Survey (1841) south of the village, and Charles Newman, who purchased a large grazing property around Mullum Mullum Creek's confluence with the Yarra River. His 'Pontville' homestead (1843) is heritage listed. During a survey of the area in 1844 the landscape was described as moderately timbered with gum and oak. The timber provided a living for settlers when they cut it for firewood or charcoal burning. The cleared soil, mainly on sandstone and mudstone, was good for agriculture. Templestowe became a fruit growing area. Early institutions were the Anglican and Presbyterian churches which opened schools in 1853 and 1854, and Finns Upper Yarra Hotel near Finns Reserve in Templestowe Lower. Delicensed in 1922 it was used as a residence until burnt down in 1967. 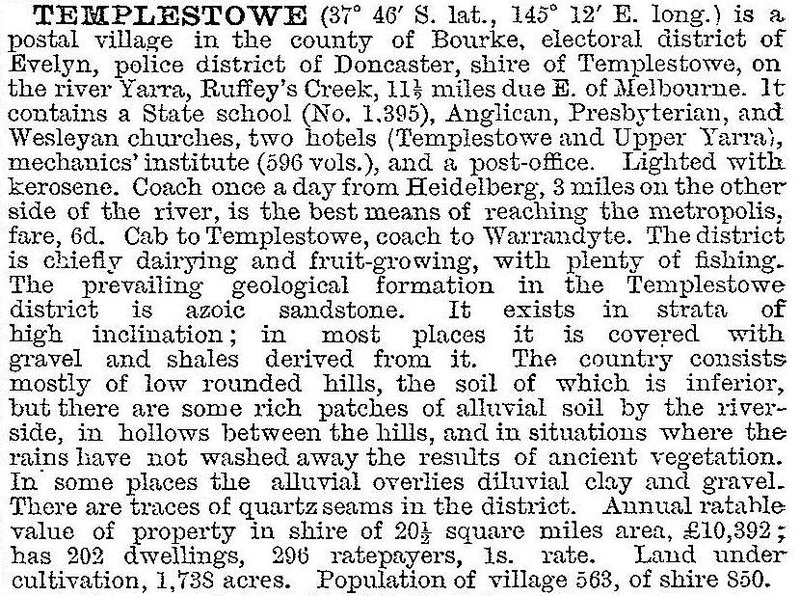 The Templestowe District Road Board was created in 1856 when closer settlement caused the rutted tracks to be in need of maintenance. The Board's boundaries included Doncaster and Warrandyte to the east, and when it became a shire on 7 May 1875 the shire was named Bulleen, the name of the Parish (and later the name of a district to the west, associated with Heidelberg). The formation of the shire coincided with the replacement of the church schools with a State school in 1874. Doncaster was severed from the shire in 1890, and in 1892 Bulleen Shire was named Templestowe Shire. A cooperative cool store was built by local growers in 1919 and was a landmark at the corner of Porter Street and Fitzsimmons Lane for over 50 years. Orcharding reached its peak in the 1920s and 1930s. The rural landscape was not much disturbed by urbanisation until the 1950s, but during the 1960s orcharding retreated northwards. Petty's orchard, near the Yarra River, is preserved to demonstrate Templestowe's orcharding heritage. It has over 200 varieties of apple. The pace of urbanisation is evident from the opening of State schools: two primary schools between 1966 and 1971, a high school in 1961 and a technical school in 1971, all in Templestowe Lower. Templestowe's State primary schools are Serpell school and Templestowe Park (1977) which replaced the original school. Templestowe's landscape has been an attraction for generously proportioned – sometimes opulent – houses, replete with pools and tennis courts. In 1987 the median house price was 207% of the median for metropolitan Melbourne, slipping back slightly during the 1990s. Templestowe is associated with Doncaster, their having become a united municipality in 1915 and going on to become one of metropolitan Melbourne's largest cities (in terms of population) in the 1980s. Shopping is found at the Templestowe Village shopping centre and a few kilometres southwards at the regional Doncaster Shoppingtown. The shops are near the location of the first State primary school in Anderson Street (c1874) along with the mechanics' institute/memorial hall (1882, 1922), and the Uniting (former Presbyterian) church (1895, 1962). The recreation reserve is north-west, in Porter Street. Templestowe has two State primary schools and a Catholic primary school. Secondary education is found in Templestowe Lower, Doncaster and Eltham. The north part of Templestowe includes large metropolitan parks adjoining the Yarra River: Westerfolds, Candlebark (with Petty's Orchard) and Tikalara.